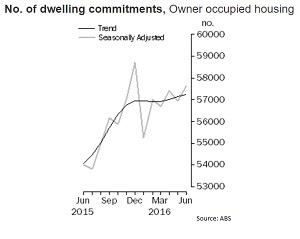 FINANCE for new dwellings and first home buyers remain positive in June, according to the latest Australian Bureau of Statistics Housing Finance figures, released today. 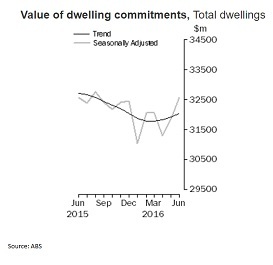 The total value of dweling commitments was $32.6 billion, up 2.3 per cent on the previous month, seasonally adjusted, while the trend estimate is up 0.4 per cent on the previous month. Of the dwelling commitment value, $20.7 billion was owner occupied housing (up 1.8 per cent) and 11.8 billion was investment (up 3.2 per cent) in the seasonally adjusted figures. Wilhelm Harnisch, CEO of Master Builders Australia says the data supports the market view that new home buyers remain confident, a state of affairs that will be boosted by this month's rate cut. "The number of housing loans for construction of new dwellings rose by 2.1 per cent and the number to purchase new homes rose by 2.7 per cent," says Harnisch. "Pleasingly, the number of loans to first home buyers held up well at 14.3 per cent of total finance approved. First home buyer confidence will also be boosted by the recent rate cut. "The relatively high number of housing loans will translate into higher levels of approvals and, in due course new housing activity in the next few months. "This will ensure that the residential building sector remains a ray of sunshine in the economy, particularly in providing jobs." Today's figures stave off concerns of a hard landing to the apartment building boom that has been ongoing in the east coast capital cities for two years.